How do you keep Cleveland talent in Cleveland? It’s a problem that has vexed educational institutions throughout Northeast Ohio for decades. Many of the region’s best and brightest young minds have attended local colleges or universities only to graduate and seek better opportunities elsewhere. In 2015, the Jack, Joseph and Morton Mandel Foundation gave Cuyahoga Community College the largest gift in its history with the goal of stemming that tide. The Jack, Joseph and Morton Mandel Humanities Center, located at the Eastern Campus, would give students the opportunity to pursue an education rooted in the humanities and focused on leadership and community involvement. Nearly four years later, the center is fulfilling its mission. More than 50 students have graduated from the program since the initial class walked across the stage in 2017. Those students are now on the verge of graduating with bachelor’s degrees from local universities such as Cleveland State, Case Western Reserve, Baldwin Wallace and John Carroll. 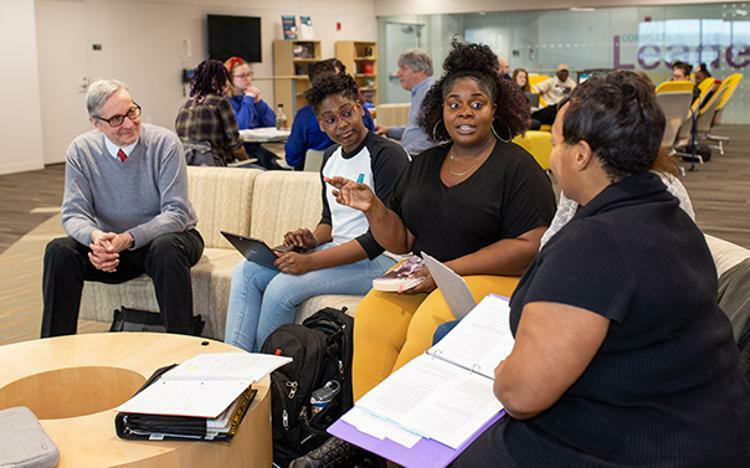 Though the goal of the Mandel Humanities Center is to educate future local leaders, the lessons taught in the center range far beyond Greater Cleveland — sometimes by hundreds of miles. This past February, 22 second-year Mandel Scholars traveled to Alabama to visit Selma, Montgomery and Birmingham, retracing the steps of the civil rights marches that contributed to the passage of the Voting Rights Act of 1965. In May, students will travel to Washington, D.C., to get a firsthand look at the inner workings of the federal government. The out-of-state trips are the highlights of the semester, but the center also introduces students to many local organizations and events that increase their knowledge of the arts, public service and the humanities. Mandel Scholars attend speaking events at the City Club of Cleveland and performances at Playhouse Square, and they collaborate with local organizations on community service projects. First-year student Yeymi Cedeno Guerrero volunteers with the Spanish American Committee, a nonprofit organization that aims to improve the quality of life for Hispanic residents in the Cleveland area. Cedeno Guerrero, 21, has been nominated for a 2019 Newman Civic Fellowship. She plans to graduate from Tri-C in 2020 and continue her education at a four-year school. Her experience at the center has been part of a larger personal transformation that has taken place at Tri-C.
Cedeno Guerrero is one of 124 success stories-in-progress at the Mandel Humanities Center. The goal, according to Jordan, is to have 200 students in the program at any point in time, with as many as 100 graduating from Tri-C each year. Alumni leave ready to take their newfound understanding of the humanities to four-year schools and, ultimately, to become the region’s movers and shakers — citizens occupying influential positions in the businesses and governments of Northeast Ohio.